Yellow-spotted floodplain monitor (Varanus panoptes) are imperiled with the invasive cane toad expansion in Western Australia. Credit: Roebuck Bay Working Group Inc.
With the West Kimberley one of the last 'mega diverse' places in tropical Australia to be invaded by cane toads, the audience of more than 70, were keen to hear what researchers are doing to reduce the cane toad's devastating impacts on the wildlife in the region. What is particularly alarming about these Amazonian toads (Bufo marinus), is their rate of adaptation to the Australian environment, including recent physiological changes that have enabled faster travel across northern Australian, and a high fecundity. Did you know that females can lay up to 60,000 eggs per year? The aim of Georgia's research is to aid the survival of goannas as the cane toads move with alarming speed westward into the Kimberley. Trialling a new technique called 'conditioned taste aversion therapy,' the goannas are exposed to small doses of toad toxin (young teacher toads of a certain size) just before the real cane toad invasion reaches an area. These small toads will make the goannas sick, but won't kill them. The good news is that the training is working, with the goannas remembering their bad experience and avoiding the large toads that could kill them. When asked why she had singled out wild goannas for taste aversion training, Georgia indicated the importance of these goannas as apex predators in keeping local ecosystems stable, have sensory tongues and are intelligent which helps with their training. 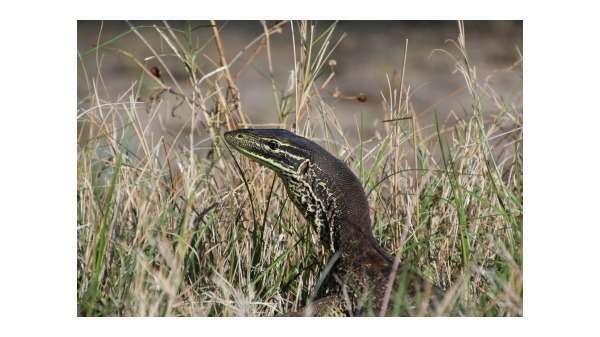 Moreover, the wild goannas are culturally important. "Time is running out for our wildlife, so the question should not be 'what is the cost of trying?' rather, 'what is the cost of doing nothing?'" Georgia Ward-Fear said.